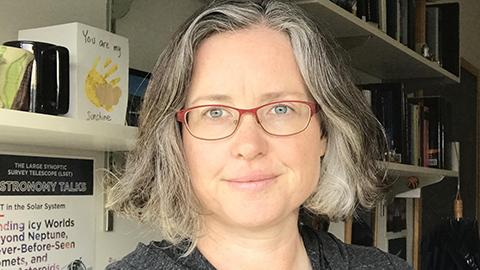 Lynne Jones is a research scientist working at the University of Washington for the Large Synoptic Survey Telescope (LSST). Her official title is “LSST Performance Scientist”, which basically means she does a lot of different things as necessary to understand the result on the efficiency of the LSST survey. This includes studying the potential for discovering and characterizing asteroids with this next-generation telescope. From 2009 to 2017, she served as one of the co-chairs for the LSST Solar System Science Collaboration. Dr Jones received her PhD from the University of Michigan, conducting surveys to discover some of the faintest known (at the time) TransNeptunian Objects.